a telegraphist q.v. transmitting messages by means of baudot machine, whereby varying messages, conveyed by operator's fingers to a key board, are transmitted over wires to receiving office, where message is automatically transcribed in printed characters on revolving paper tape. as for telegraphist, in service of cable telegraph company, operating telegraph instruments by which messages (largely in code or in foreign languages) are transmitted and received by cable to or from distant countries; is often required to spend part of term of service at stations abroad. is employed in London branch post offices to sell stamps, postal orders, etc., and to receive parcels, registered letters, telegrams, etc., to pay out pensions, etc., to transact business connected with the Post Office Savings Bank and telephone service, to issue licences, etc., and to operate telegraphic instruments for transmitting and receiving telegrams. a telegraphist q.v. who perforates tape with message by means of a key board, and passes perforated tape through machine ("gell" machine) whereby message is transmitted over wire to receiving office. a telegraphist q.v. in Central Telegraph Office engaged on duty involving correct distribution of press messages received for transmission. a telegraphist q.v. during probationary period of appointment; works under experienced telegraphist while duties are being learned. obsolete term, see repeater officer. in charge of telegraph repeater instrument at relay station; watches correct functioning, makes necessary adjustments and renders periodic reports. is employed in provincial post offices as sorter (753) q.v. and/or telegraphist q.v., and/or counter clerk q.v. 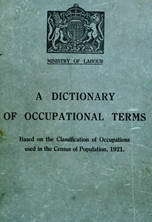 unofficial term, may be telegraphist or counter clerk and telegraphist in London, or sorting clerk and telegraphist q.v. in provinces. is employed in the Central Telegraph Office, London, to operate instruments for transmitting telegrams and cablegrams; sometimes designated according to the type of apparatus used, e.g. baudotist, gellist q.v., in branch post offices, telegraphic duty is performed by counter clerk and telegraphist q.v. operates telegraphic instruments for transmitting and receiving telegrams and cablegrams.